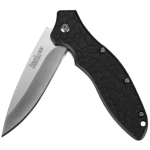 If you have been looking for an affordable knife to carry for every day use that is dependable, wear-resistant, sharp and yet lightweight, the Kershaw Skyline may be the perfect choice for you. The Kershaw Skyline is a versatile, lightweight and high quality knife that is perfect for every day carry. These knives continue to hold their value for years and are a great investment for collectors and those seeking to resell them down the road. It’s easy to see why these useful knives are so popular by just looking at all of their great features. For example, the razor sharp .09 inch thick and roughly 3 inch long Sandvik 14C28 blade of this knife is perfect for a wide variety of different uses. Whether you use it to effortlessly cut through packing tape, or easily open up a bag of chips, or slice quickly through twine, the impressively sharp blade of the Skyline is an excellent choice to get the job done right. Though it has a non-serrated edge, the Skyline is even strong enough to be used to cut through rope. Though the blade on the Skyline is not a truly double-edged blade, the reverse side of the blade is beveled. The blade has studs that will also help to stop it and make sure that it does not hyper extend during use. You can also use them as thumb studs. The blade slides in between a pair of slender brass washers, which allows the action on it to be effortlessly smooth. This knife stays closed rather well because it locks into place in the liner by means of a steel ball that presses against a small dent in the blade. This excellent quality knife is also highly resistant of corrosion and is able to withstand high amounts of usage before becoming worn out. Many enthusiastic Skyline owners report not having to replace this impressive knife for years. The Skyline opens easily by means of a manual flipper. You can open it with either hand quickly and easily by pulling back on the flipper and rolling your wrist. If you hold the blade point downward, you can open it without even having to flip your wrist. This handy feature, which is called gravity assist, can be very useful when you need to open your knife quickly. The Skyline is also quite easy to grip. 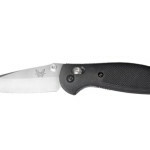 It has highly textured G-10 handle scales which can help your hands remain firmly in place while cutting. This incredibly well designed handle also contours to your fingers. There’s no way this knife is going to easily slip our of your hand during regular usage! Unlike many knives that have these easy-to-grip handles, the Skyline is uniquely slender. It will not feel big and bulky in your pants pocket. Another very helpful feature of the Skyline is that it has a strong lock for the blade so that you can be sure it will stay open when you are cutting with it. 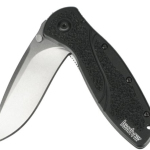 This knife is easy to carry around with you as it has a pocket clip that can hold it in place with the tip facing either upward or downward in your pocket. 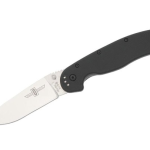 The Skyline is made in the United States and was designed by knife designer Tommie Lucas. This functional knife is fashionable as well, coming in a variety of different styles to meet the differing tastes and needs of buyers. There are several grip colors available for the Skyline, such as the classic black, as well as red, orange, tan, and blue. There are also black DLC, Damascus, and bead-blasted blade treatments available. With all of these choices to pick from, knife collectors can stock up on the different varieties of the Skyline to add to their knife collections. 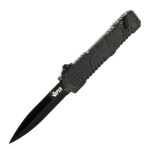 Even if you are not accustomed to regularly carrying a knife around with, you may want to try out the Skyline. The Skyline is loved by both collectors and knife enthusiasts who want a good value. It is both elegant and sleek, yet durable and rugged at the same time. After you spend some time using this amazingly handy knife, you will probably want to carry it with you wherever you go!